Mayumi Nakagawa, M.D., Ph.D., (seated) is joined by (left to right) Peter Emanuel, M.D. ; Anna-Barbara Moscicki, M.D. ; Stephanie Gardner, Pharm.D., Ed.D. ; and Aubrey Hough, M.D. April 27, 2017 | LITTLE ROCK — Mayumi Nakagawa, M.D., Ph.D., was invested April 26 as recipient of the Drs. Mae and Anderson Nettleship Chair in Oncologic Pathology at the University of Arkansas for Medical Sciences (UAMS). She is a professor in the Department of Pathology and Laboratory Sciences in the UAMS College of Medicine and co-leader of the Cancer Prevention and Population Sciences Program in the UAMS Winthrop P. Rockefeller Cancer Institute. The Nettleship chair is the result of generous gifts by husband and wife pathologists the late Anderson Nettleship, M.D., and the late Mae Nettleship, M.D. The chair will be used to support Nakagawa’s research related to human papillomavirus (HPV) and cancer. “We are grateful for the generosity of the Nettleships in endowing this chair in oncologic pathology. Their forethought has ensured that our researchers will have the support they need to explore and advance cancer research for many years to come,” said Stephanie Gardner, Pharm.D., Ed.D., senior vice chancellor for academic affairs and provost. The chair was previously held by Aubrey Hough, M.D., inaugural university professor and distinguished professor in the Department of Pathology in the UAMS College of Medicine. An endowed chair is the among the highest academic honors a university can bestow on a faculty member and is established with gifts of $1 million, which are invested and the proceeds used to support the educational, research and clinical activities of the chair holder. Those named to a chair are among the most highly regarded scientists, physicians and professors in their fields of expertise. Nakagawa graduated from the M.D./Ph.D. program at Albert Einstein College of Medicine in Bronx, New York. After medical and graduate schools, she received her residency training in clinical pathology at the University of California at San Francisco, where she began her studies of immunity against HPV resulting not from an antibody but from a person’s own cells. 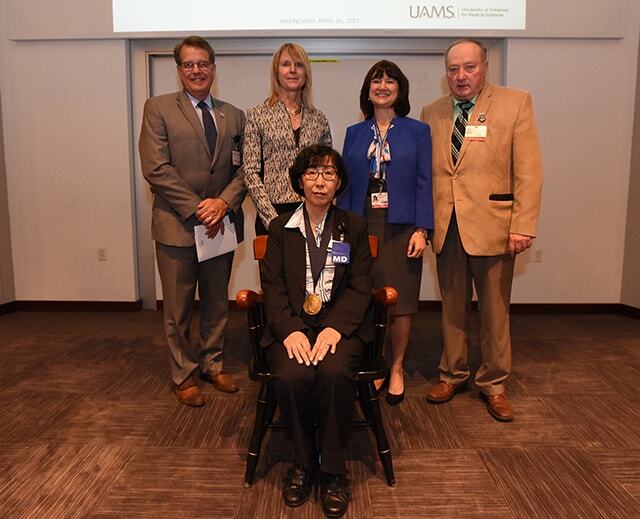 After joining the faculty at UAMS in 2004, Nakagawa continued her research pursuits in the area of HPV immunology and provided patient care as an attending physician for the Transfusion Medicine Service in the Department of Pathology. Her research team’s work at understanding the science of naturally occurring HPV infection, led to the design of a therapeutic vaccine for treating patients with cervical dysplasia or pre-cancer. A phase 1 clinical trial that tested the vaccine’s safety was performed from 2013-2015 and was supported by a grant from the National Cancer Institute (NCI) of the National Institutes of Health (NIH). A phase 2 clinical trial testing the effects of the vaccine is now underway. Nakagawa’s research group has presented their findings at many national and international scientific meetings, including at international papillomavirus conferences. She has continuously received outside funding from numerous organizations such as the NCI, Cancer Research Institute and the American Cancer Society. Nakagawa serves on various NIH study sections and numerous committees inside and outside UAMS, including serving as chair of the mentoring committee of the UAMS Women’s Faculty Developmental Caucus since 2013. Anderson Nettleship served as chairman of the Department of Pathology in the UAMS College of Medicine from 1947-1954 and was instrumental in development of the college as a research institution. He organized the UAMS Medical Illustration Department, began the pathology residency program and served as the first state medical examiner. Mae Nettleship served as medical director of laboratories at Washington Regional Medical Center and Fayetteville City Hospital. Together, the Nettleships founded Antaeus Lineal Medical Research Laboratories, which gave pre-medical fellowships to more than 200 students, several of whom became prominent UAMS faculty members. For 18 years, they provided an environment to encourage high school and college students in the study of medicine and health-related fields by creating a summer fellowship program and a school of medical technology. Continuing their support of education, the Nettleships founded The New School in 1971 for excellence in childhood education.